As you may have heard, the Governor signed into law new legislation that now changes a California condominium’s associations ability to prohibit an owner from installing a solar energy system on the common area roof. AB 634, which went into effect on January 1, 2018, amended several provisions of the California Civil Code to set forth language that further clarifies what condominium associations can and cannot do with respect to the installation of an owners own solar energy system on a common area roof and exclusive use common. •	Requiring membership approval for an owner’s encroachment on a common area roof for the installation of solar energy system equipment. This new legislation was the idea of a couple who reside in a seniors-only condo association in Northern California. They wanted to install a solar energy system on the common area roof and got the OK from their association so long as they got the approval of 67% of the rest of the owners pursuant to Civil Code § 4600 that prohibits the association from granting exclusive use of any portion of the common area to one owner without that approval. All they wanted to do was eliminate that requirement. What they originally wanted morphed into so much more. 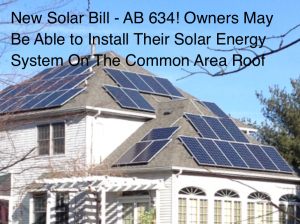 AB 634 adds Civil Code § 4746 which sets forth certain requirements and guidelines for associations reviewing an application for installation of solar energy systems on common area roofs. •	The applicant is to notify each owner in the building of the proposed solar energy system installation. •	Owners/successive owners shall carry an additional insured policy for homeowner liability coverage naming the HOA, and must provide the HOA with proof of insurance within 14 days of approval and annually thereafter. Civil Code § 4600 now states that solar energy system installations are an exception to the rule requiring approval of 67% of members before the HOA can grant exclusive use of any portion of the common area to a member. Therefore, owners are no longer are required to obtain membership approval of 67%. But they will be required to, among other things, show that an equal allocation of the usable roof area is possible. SwedelsonGottlieb strongly encourages condominium associations to reach out to legal counsel to adopt guidelines and procedures for the installation of solar energy system systems. 1)	Adopt an application process to install a solar energy system with the requirements. 2)	Require maintenance agreement that runs with the property (meaning recorded on that unit binding the current owner and all future owners) that requires the owner to maintain and repair the solar energy system. 3)	Require annual inspection of system safety and routine maintenance. 4)	Require owner to have system removed at their expense for proper maintenance of association roofing system. 6)	Require a construction deposit for damages to common area.